Have you heard about the Portable Toshiba Viamo Ultrasound Machine? 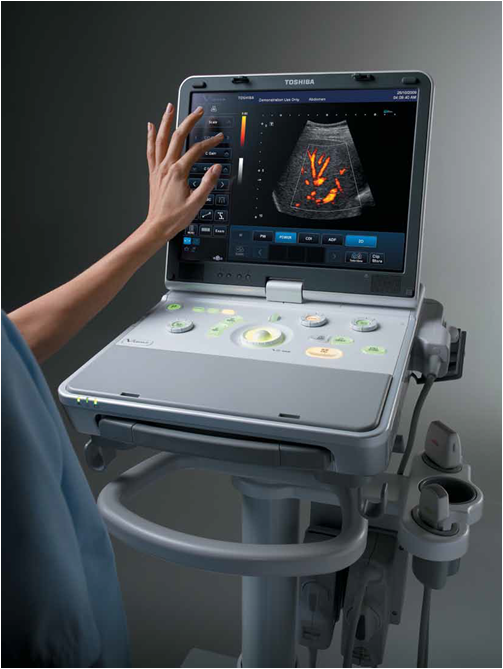 The Toshiba Viamo combines all the advantages of a portable ultrasound system with the diagnostic precision, productivity and comfort of a premium cart-based machine. It shares its core imaging engine and transducer technology with the Toshiba Aplio™ series, and offers uncompromized image quality and clinical workflow support in situations where unlimited portability is required. The Viamo features a built-in touch screen that allows for seamless workflow and an outstandingly comfortable and intuitive operation of the system. Viamo’s monitor can be rotated to enable free positioning of the screen. When fully turned and folded flat, Viamo can be operated in tablet mode solely via its touch screen. Individual key functions on Viamo’s console and touch screen are user programmable to suit your specific diagnostic requirements or personal preferences. A whole range of workflow automation functions is available on Viamo. One-touch QuickScan for instance helps you achieve better imaging results in less time by automatically optimizing your imaging parameters. And Viamo’s innovative SonoSet™ function allows you to carry out examinations conveniently by simply executing freely programmable protocols step by step. 2D, B-mode, M-mode, Color Flow Doppler, Spectral Doppler- PWD, High PRF, Advanced Dynamic Flow (Directional Color Power Doppler). TwinView™, Pulse Subtraction™ THI (Tissue Harmonic Imaging), Compound Imaging- Aplipure™, Quick Scan, Speckle Noise Reduction- TissuePure™, 8 GB internal memory storage, 2 USB ports. Have you considered renting an ultrasound machine? Click here to read our blog, Ultrasound Rental – 10 Reasons It Makes Sense! Would you like to see the Viamo's image quality? Click below to request an live, online virtual demonstration. United Medical Instruments, Inc. offers a wide suite of ultrasound solutions. Visit us at www.umiultrasound.com or contact us at 877.490.7036 to get in touch!